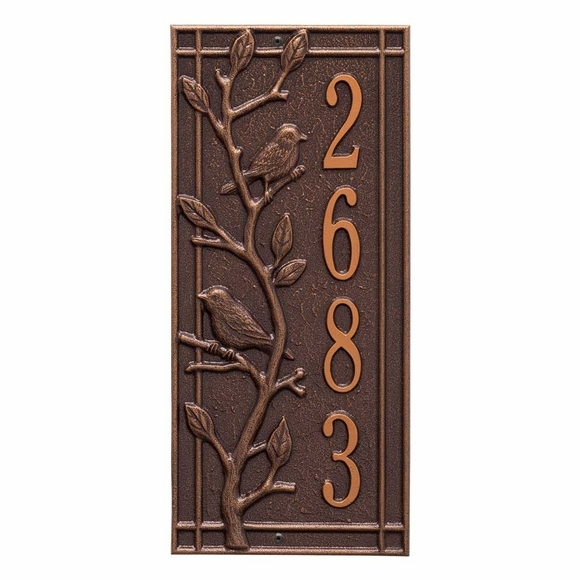 Vertical Address Plaque with Birds - - perched on a decorative tree branch. Tall 7.5"W x 16.5"H address sign for narrow spaces. Wall mount. Made in USA. The unusual double border accentuates the vertical orientation and enhances the curb appeal of the sign. Holds a house number up to four (4) 3" characters. Smaller images (from left to right): black/gold, black/silver, bronze/verdigris, oil rubbed bronze, and bronze/gold. Dimensions: 7.5"W x 16.5"H x 0.375. Branch and Bird vertical address plaque custom made in USA.